What Does the Herb Turmeric Do? Why Is Turmeric Good for You? Can Turmeric Cause Blood Sugar Levels to Drop? What Is a Turmeric Rhizome? Turmeric is a popular spice around the world, used in many different cuisines. It is also used as a dye due to its bright yellow color. Turmeric is used in fabrics and as a body paint during traditional Indian celebrations. As a spice, turmeric is found in mustard, butter and curry. The spice resembles ginger in its formation. The ground turmeric commercially available comes from the "rhizome" of the plant. A "rhizome" is an underground stem that resembles a plant's root. It typically grows horizontally and branches off in many directions. Turmeric spice and dye are processed from this part of the plant. Raw turmeric in its original form strongly resembles a ginger root, which is also technically a rhizome spice. The finely ground turmeric powder that is easily purchased in most supermarkets and spice markets is processed from a turmeric rhizome. This part of the plant is boiled, then dried. Next, the rhizome is ground into a fine spice. It is in its strongest state soon after grounding. Over time, the spice loses flavor. The turmeric rhizome is a dark orange color. After it is processed into a spice, the powder is slightly brighter in color. When added to foods, however, turmeric is diluted and appears as a bright yellow. It gives both mustard and butter their characteristic bright yellow color and is also the main ingredient in yellow curry sauce. Yellow rice is often made with turmeric as well, or a mixture of turmeric and saffron, another yellow spice. The strong yellow staining power of turmeric is sometimes used to color fabrics, such as cotton, wool and silk. Indian sari robes are an example of turmeric dye that is used to produce bright and imaginative clothing. Additionally, a paste may be made from turmeric powder and water. During traditional Indian celebrations, such as Holi, the paste is applied directly to the skin as a body ornament. Turmeric has been used for thousands of years in both Chinese and Indian medicine to treat many common conditions, including digestive trouble, bone and joint pain, and liver ailments. More recently, Western research has looked at the antioxidant and anti-inflammatory properties of turmeric's main ingredient, curcumin. This compound is responsible for turmeric's bright color. 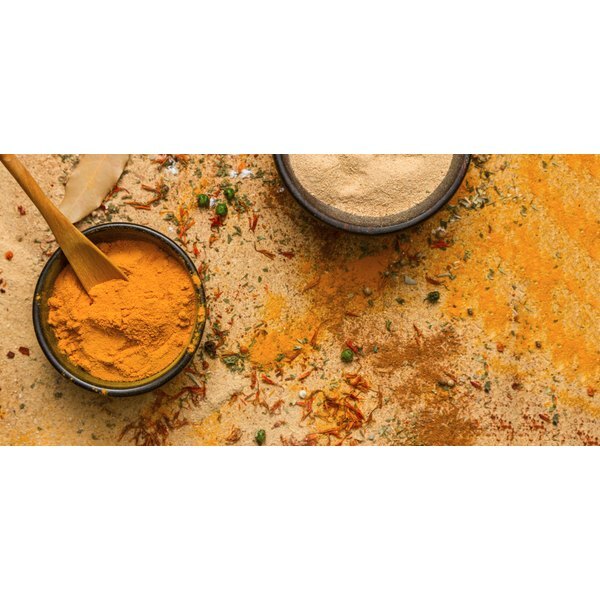 The National Institutes of Health (NIH) notes that lab studies of curcumin show some evidence of potential benefits in the treatment of cancer. However, more clinical trials are necessary to determine its effects in the human body. James Highland started writing professionally in 1998. He has written for the New York Institute of Finance and Chron.com. He has an extensive background in financial investing and has taught computer programming courses for two New York companies. He has a Bachelor of Arts in film production from Indiana University. What Spice Is a Substitute for Turmeric?